The magic in this DVD is simple, direct, and powerful. A deck of cards, and a sharpie, and some moderate skills in sleight of hand is all that is required to bring some hard hitting magic tricks strait to your spectators without any extra gimmicks to carry around with you. These aren’t commercial tricks, these are working tricks that you’ll use all the time, everywhere you go. A practical one man walk around show in a single DVD. This is Sparks. JC James has an amazing amount of skill. It’s no wonder he’s one of the busiest working magicians in Europe. Just watching him work you’ll see him make some of the hardest sleight of hand moves look butter smooth and painfully easy. This DVD covers 13 of his personal routines which you will find absolutely useful. These aren’t things that a beginner magician will fun. They require some time and dedication to learn. Let’s take a look at what’s taught on this DVD. Spin: Take a marker, or borrow a pen, pencil, anything really, and as you slowly spin in around in your hands it vanishes before the spectators eyes! I love the flip stick method and this is just another move to use to make a marker vanish. It’s very visual, very fooling. It’s also angle sensitive. Latex Slydini: You either use a rubber band that you produce, or one can be borrowed (but other than magicians who honestly carries rubber bands around with them these days?!) and placed around the performer’s hand. The performers hand can be held by spectators and when it’s opened the rubber band will be gone replaced by any small object you want, like a dollar bill! You can use this to produce a signed playing card in the ultimate ending to the ambitious card routine. POG Production: You can make four cards jump out of the deck without the need for a gimmicked deck. This is great for a four ace production, or any setup to a card trick that requires four cards. Hell you could also just use this to shoot four random cards out of the deck if you really wanted to because it just looks cool. The drawback is that this move is knacky and can be finicky sometimes. You’ll need to work with this one quite a bit to get it dialed in right. Wave Change: You wave a card back and forth causing it to change into another card. The drawback to this is you have to place it back on the deck first. As a magician we criticize the little things like this when in reality the majority of the people we perform for won’t even notice. This is a color change and can be applied to many different effects. I like the usefulness of this move. ACAP (As Close As Possible): Four cards are placed in different parts of the deck, and then the deck is squared up and set on the table. Without touching it the four cards appear in the center of the deck all together again. ACAP is another powerful utility move to control a packet of cards, but even on its own the move is powerful magic trick. The move though is knacky and will require practice. Fake Tilt: This is another version of the Marlo Tilt. It is a false tilt, as the name implies, and can be done with a single card or multiples. This is another utility move that will have greater importance beyond the limited presentations seen in this DVD. CHLAK: This is a four for four switch out move that has many applications. In the basic form, the spectator blindly points to the backs of four random cards. Then when they are pulled out of the deck and turned over they are all four matching cards. You could use four Queens, four Aces, four Kings, etc. Fan Change: This utility color change move looks absolutely amazing on camera and it looks even better in person. I LOVE this move! Four cards are held, say four queens for example, then you simply flick one of the cards and it instantly changes into a different card. Could be a card a spectator already selected from before. The applications are endless! The drawback is this is a move knacky thing to master. Clean Transpo: Another utility move. You have two cards selected. One placed on top of the deck, the other on the bottom, and in a flash they trade places. Drunken Production: A comical plot where you end up producing all four jacks while acting like you’re not sure what is going on. The magic is happening to you as well as the spectators. After the four jacks have been produced an indifferent card is selected. You’ll try to put the indifferent card away and use one of the jacks but it keeps coming back. You add it to the pile of jacks but when they are turned over they are the four matching indifferent cards. I love this routine. Anytime you can share a comical moment with the audience is a special one. UnSleeve: I’ve always hated trying to sleeve coins and pens. I’m not good at it, and it drives me up a wall. Justin Millers “Dream’s of Silver” was the bane of my existence for a good couple summers before I ultimately just gave up trying to sleeve beyond anything that would be equated to just fooling around. UnSleeve is a very unique way to approach sleeving, and has gotten me to pull back out my coins once again and re-try learning this old technique. Behind the Force: You say you need a specific card for a trick, for example the nine of hearts, and you ask a spectator to say stop EXACTLY on that card. They call stop, you split the deck, and low and behold it’s the nine of hearts. I’m not a fan of this move because it’s too fast and it just looks like you did something “magical”. I haven’t played around with it too much personally, so maybe someone out there will figure out a way to make it look more natural but on the DVD it’s just too jerky. T2P: This was a pretty neat routine actually. This is a unique variation to the classic card to pocket routine. A card is selected and signed, and after it’s been produced from the pocket in the usual method, a twist occurs. It’s returned to the deck. Your finger is placed over the card and moved down slowly and it visually starts to disappear. When they call stop you remove your finger showing half a signed card on the deck, and the other half of the signed card is now in your pocket. The drawback is to make all this work there’s a lot of visual do as you explain motions going on which seems unnecessary to me. The routine is cleaver, but I’m not sure I’d use it myself. Overall I’m pretty impressed with this DVD. There’s a lot of strong magic in here. Some of it will require a lot of effort to master. Other tricks on here I’m not sure I’d really use myself because, at least how it’s taught on the DVD, they look too “magiciany” in how they’re handled. I’m not a fan of sharp fast movements. There are many very useful utility moves in Sparks and whether you perform the tricks as they are out of the package or you incorporate the moves into your existing tricks you’ll find a little something in here for everyone. Skillful sleight of hand, coupled with move knacky sleights, and magically motivated not naturally motivated moves makes for a collection of material that is sure to have something in here for everyone. The moves are easy to learn but some of them are hard to do. It takes time to master. I liked Sparks. There’s a lot of good material in here that you can do with just a deck of cards and a marker. No gimmicks, and easy set ups. Have a product you want reviewed? Want to see if it will stand up to the Draven Seal of Approval? 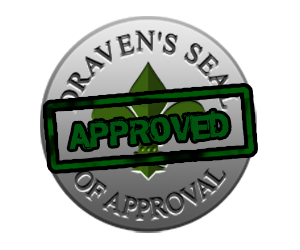 Contact me directly at draven@williamdraven.com to find out how your product could be on the next Draven Reviews! This entry was posted in DVD Review, Product Review, Reviews and tagged Card Magic, Close Up Magic, Magic, Magic Tricks, Walk Around Magic. Bookmark the permalink.